For other places with the same name, see Brisbane (disambiguation). View of Brisbane from Kangaroo Point. Like most Australian capital cities, Brisbane features a large urban sprawl with many different areas having their own unique features and characteristics. The CBD (locally referred to as "The City") is where Brisbane's major businesses are interspersed with several shopping malls, cinemas, parks and many of Brisbane's historical tourist sites. Queen Street Mall  in the heart of the CBD is Queensland's premier shopping destination and a must see for all visitors. South Bank (often misspelled as 'Southbank') has ethnic restaurants, edgy cafes, riverside boardwalks and an inner-city beach. Located at South Bank is Queensland’s Cultural Precinct, which includes the Performing Arts Centre, Queensland Museum, the State Library, Queensland Art Gallery and the spectacular Gallery of Modern Art (GoMA). The term South Bank is also commonly used to refer to South Bank Parklands, which was the site of World Expo 88. Fortitude Valley (or "The Valley")  combines Brisbane's Chinatown, alternative shopping and vibrant nightlife. Eclectic bars with emerging and innovative DJs and world-class super clubs have brought a larger than life feel to the Valley precinct. Home to the best live music and entertainment scene in Australia. West End, located just behind South Bank, is an edgy, bohemian district with artsy shops and cafes. West End is where you’ll find alternative books, cult video stores and organic produce and quirky locals. The area has several waves of immigration to thank for its feel, from the Greeks in the 1950's and 1960's and the Vietnamese in the 70s to the urbanisation of the last few years creating a new vibe. New Farm, located next to The Valley, features upmarket shopping and trendy dining places. A confirmed favourite of the locals, New Farm is high up on the hot list of places to be and to be seen. Hamilton Hamilton is home to Racecourse Road, one of Brisbane's oldest urban villages nestled next to some of Brisbane's most expensive real estate. It is a lovely Poinciana tree lined boulevard, which in December is a blaze of red flowers worth seeing. Fashionable shops are mixed with restaurants to see and be seen at just a few klms from the city centre. Portside Wharf, located at Hamilton, is where the cruise ships dock on the Brisbane River. This area was formerly known as Brett’s Wharf and offers fine dining, cinemas and specialty shopping. A great place to wander and have a meal. Paddington / Rosalie / Milton. Paddington is quickly becoming the place to shop with many little, unique boutiques full of local designs and hard to find fashion gems. Rosalie is home to many quaint bars, markets and restaurants. Milton has two of Brisbane’s most famous icons placed side by side - the Castlemaine (XXXX) brewery and Suncorp Stadium. Mount Coot-tha, a suburb as well as a mountain (more accurately, a large hill) approximately 6 km (4 mi) west of the CBD, easily recognised by the large TV and radio antennae that line its peak. The bushland area has numerous walking and cycle tracks. There is a scenic drive through the Mount Coot-tha Reserve which climbs to the Summit , which has a restaurant and cafe, and offers majestic 360° views of Brisbane and the surrounding region. Mount Coot-tha also features at its base the Brisbane Botanic Gardens  and the Sir Thomas Brisbane Planetarium. Sunnybank, a suburb that has a large Asian population. A great destination for authentic Asian food. Head to Market Square. Bulimba, a suburb located east of the CBD just across the river from New Farm, boasts some of Brisbane's best restaurants, easily accessible by ferry from New Farm Park and the CBD. Moreton Bay, part of greater Brisbane and is located to the north of Brisbane City. The region is known for festivals, markets and protected environmental areas. It is a great place to relax and unwind within an hour of the CBD. Most inner-city suburbs have their own style and offer some small, unique attractions, notably cafés, restaurants, historical sites or artistic ventures. Some of the other major districts are Spring Hill, Indooroopilly, Manly Harbour, Toowong, St Lucia and South Brisbane. For many thousands of years Aboriginal people have lived in what is now known as Brisbane. In 1823, John Oxley was the first English colonist to explore Brisbane, which was then selected by the colony of New South Wales as the location for a new jail, intended to house dangerous prisoners in a remote location. The settlement was named "Brisbane" after Sir Thomas Brisbane, the Governor of New South Wales at that time. The original settlement was established in what is now the suburb of Redcliffe but was later moved to a location further down the bay. In 1837, free settlers moved to the area and pushed to close the jail and to release the land in the area. In 1859, a gold rush led to the establishment of the colony of Queensland with Brisbane as its capital, named after Sir Thomas MakDougall Brisbane, the sixth Governor of New South Wales. In 1925, the Queensland State Parliament created the City of Brisbane Act, and set up a single government for the city of Brisbane. 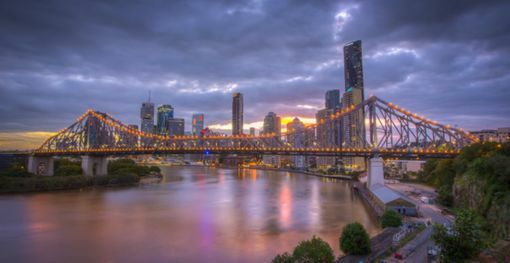 Recent strong migration to Brisbane and the whole of south-east Queensland is taking place due to cheaper house prices, a pleasant climate, and good employment opportunities. The area is currently facing the challenge of providing enough fresh water for its residents. You're not likely to find the tap dry or see any visible signs of the shortage, but keep your showers relatively brief (local water restrictions call for 4 minute showers). 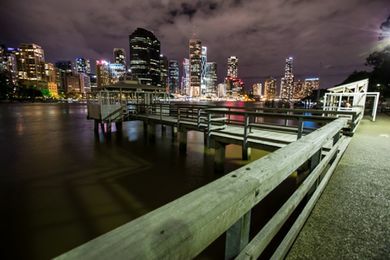 Brisbane is notorious for having been established on the floodplain of the Brisbane River, which has resulted in major floods in 1893, 1974 and 2011. The flood in January 2011 damaged various infrastructure along the river and surrounding suburbs, but most businesses and services have since recovered from this event. Brisbane has a year-round living climate. When the wet season hits the northern Australian tropics, Brisbane enjoys hot and clear summer days (with afternoon thunderstorms). When winter hits the southern capitals of Sydney and Melbourne sending temperatures into the low teens (°C) the Brisbane climate stays mostly dry and sunny, with daytime temperatures usually remaining above 20°C. Humidity is high during the summer months and daytime temperatures can get as high as 35°C with night temps rarely dropping below 20°C. Occasional heat waves can raise the temperature in excess of 40°C, however these are not common. Just about any outdoor activity you do at the height of a regular summer day in Brisbane will leave you bathed in sweat. In summer, a t-shirt with shorts and thongs (flip-flops) is appropriate attire for most casual activities, and air-conditioning will ensure you of a comfortable night’s sleep. Summer storms with hail and heavy rainfall are common in afternoons on hot humid days. They usually pass quickly. Limit your outdoor physical activity in the summer until you are used to the heat and drink plenty of water. Cover up with sunscreen, loose clothing, and sunglasses to protect from sunburn. The Brisbane Visitor Information Centre and Booking Centre  on the Queen Street Mall, M–Th 9AM–5:30PM, F 9AM–7PM, Sa 9AM–5PM, Su and public holidays 9:30AM–4:30PM, closed Good Friday and 25 Dec. ☎ +61 7 3006-6290. All visitors - apart from citizens of New Zealand - require a visa in advance of travel. Brisbane Airport (BNE)  is 20km (12 mi) north-east of the city centre at Eagle Farm, north of the river. There are direct flights from all Australian capitals and numerous regional centres. Major carriers include Virgin Australia , Jetstar, and Qantas. The airport is serviced by many regional airlines and it is possible to fly daily to most Asian centres (and on to Europe), the United States, Canada, the Middle East and New Zealand, without flying via Sydney or Melbourne. Allow sufficient time for the transfer between terminals. The terminals are 3km apart and it's not practical to walk with luggage between them; the main road that connects them has no pedestrian walkway and is very busy. Transfers between the airport terminals can be made on the Airtrain  service. It offers connections during the day with a train every 15-30mins. The train fare is $5, $4.50 if you book a ticket online beforehand, and the trip lasts 2min. The Airtrain fare is included by Virgin Australia and by Qantas when connecting between their flights; just present your boarding pass to the Airtrain station staff. Domestic to International Transfers operate M-F 5:40AM-8PM, Sa Su 6AM-8PM. International to Domestic Transfers operate M-F 5:30AM-7:45PM, Sa Su 5:30AM-7:30PM. Another option is the Airport Transfer Bus  service. Services operate approximately every 20 minutes between 5:20am and 10:50pm and bus stops are located outside the Qantas and Virgin Australia arrivals hall at the Domestic Terminal, and outside the arrivals hall at the International Terminal. The bus is free and this bus also services Airport Village, which is close to the Direct Factory Outlet (DFO) , a small shopping centre that specialises in clothing and homewares stores, but also contains a food court. It's expensive, but worth checking out if you've got more than a few hours between flights. Be careful though, as the last bus back to the airport terminals is at 6:20PM. Outside of Airtrain hours or if you have a limited connection time, a taxi is your only option. If your flights are booked on the same ticket Virgin Australia or Qantas may pay for a taxi when booked on a tight connection. Airtrain  connects to the city from the airport every fifteen minutes during peak times and stops at Central, South Bank, Fortitude Valley and Roma Street stations. An adult fare to the city stations is $18.5 and a return ticket is $35 and can be purchased at Airtrain stations. If you are purchasing a ticket online a week before of your travel, 15% discount for one-way or return journeys, but only if you are starting at the airport. Travel time to the city stations can be up to 30 mins. Trains start running between 5AM-6AM. The last trains leave the city around 9PM and the airport about 10PM. It is possible to take the Airtrain direct to the Gold Coast, although it is necessary to connect to a bus service at Nerang Station to reach Surfers Paradise, or at Robina Station to reach Coolangatta. CoachTrans  also provides transfers via shuttle bus to Brisbane City accommodation and to the Gold Coast. Adult fare (one way) to Brisbane City is $20, and an adult fare (one way) to the Gold Coast is $44. Fares are cheaper if you buy a return ticket. You can end up waiting up to an hour if you try to book when you arrive at the airport, so pre-booking is a must and no refunds are allowed. Travel time varies depending on the number of passengers on the bus and traffic; it could be anywhere from 20 to 60 minutes. Public transportation Using public transportation, you can get to town for around $4 only. From the airport, ride the free of charge T-bus to Skygate (Airport Village). Note that the T-bus stops near the terminal building and not at the bus stop for other buses and vans (very easy to find though, or ask at the information counter), and only some of the T-buses go to the Airport Village (express buses only go between domestic and int'l whereas regular ones also go to Skygate every 20 minutes). From Skygate, wait at the place you got off the bus and take Translink bus 590 to Toombul Shopping Centre (only 2 stops). From there you can catch a train to the city. This costs under $4 with a go card, off peak. You can also buy single tickets, however that will be more expensive. You can purchase a go card at the Airtran station for $30 ($10 deposit and $20 usable), but you cannot purchase the go card at the Airport Village or from a driver. Thus for the cheapest way of getting to town, first go to the Airtran terminal to buy a go card but don't go through the turnstile and instead backtrack to the T-bus stop. A limo transfer  is by far the most expensive way to get around, but it is also the easiest & will be more relaxing than public transportation. You can book a limo ahead of time and the driver will meet you at the airport when you arrive. Most limo companies will monitor your flight in case the flight is delayed or even arrives early. A taxi from the airport to Brisbane central costs approximately $35. A good option for getting into the City can therefore be for two or more travellers to share the cost of a taxi to Brisbane Central. Always ask a set price before agreeing to a taxi ride, however, and be sure to tell the driver how many people he/she is taking to avoid sudden price hikes with detail changes. It is additionally useful to find a local returning home to avoid drivers taking advantage of foreigners. Brisbane locals are invariably friendly and happy to skirt the system for convenience and cost savings. From Brisbane Central or Roma Street station a traveller can get to just about anywhere else in Brisbane. A Private transfer service  are available between cities and regional locations. They offer a similar service to taxi's and limo's, but at a more affordable price point. The services must be accredited by the Queensland Government and they must pre-booked by customers. The drivers must also have a driver's authority. Private Transfer services are available to transfer passengers to and from the Gold Coast Airport and Brisbane Airport, Hotels and other Tourist related locations. The Gold Coast Airport (IATA: OOL), also called Coolangatta Airport, is a low-cost carrier hub, serviced by AirAsia X, Jetstar, Pacific Blue and others. It is NOT open 24h and closes at night, so don't plan on spending the night before an early morning flight. It's around 30 minutes drive to Surfers Paradise. There is a shuttle bus connecting the airport to the main Surfside buses route on Gold Coast Hwy between Tweed Heads and Surfers Paradise. NSW TrainLink  operates two daily rail services from Sydney, with connections from Melbourne and Canberra. The M1 Pacific Motorway connects Brisbane to the Gold Coast and the Pacific Highway along the New South Wales coast. Premier Motor Service  links some centres on the east coast of NSW and Queensland to Brisbane, as well as connections to Melbourne. Greyhound Australia  link to most other locations to Brisbane. Brisbane has recently become the home to an international cruise terminal titled Portside Wharf . Brisbane is an excellent city for walking and you should have no problems getting around the CBD. Within minutes of walking in virtually any direction you will be able to find a bus, train or ferry station. Maps can be purchased from bookstores such as QBD (Queensland Books Depot) , Dymocks , any tourist information centre or viewed online. The Brisbane City Council has recently introduced a scheme known as CityCycle, which offers bicycles for hire at different stations around the city. Tourists can register for a 24-hour period for $2 or for a week for $11 . The bikes are free to use after that, as long as you return the bike to a station within 30 minutes (afterwards usage rates apply). You'll need to provide your own helmet, as it is the law and few stations offer them. 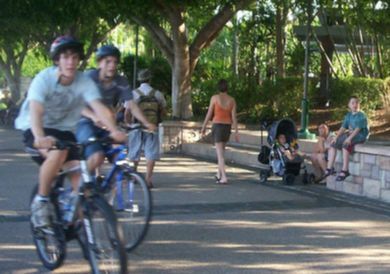 Cycling on footpaths is legal in the Brisbane City Council area, however pedestrians have right of way. Keep left and take special care when riding through South Bank Parklands as the shared (and quite wide) foot and cycle path is often clogged with large groups taking up the whole path, pedestrians stopping unexpectedly for photos and playing children running heedlessly in front of you. It is often too noisy here to use your bell, so out of courtesy and safety, you're strongly urged to dismount and push your bicycle through crowded areas. Wearing a safety helmet is mandatory in Brisbane (and the rest of Australia). The police issue a $120 fine for cycling without a safety helmet which is heavily enforced. If you are more into guided tours. Electric Bike tours around Brisbane are a great option. These guys do 2 hour tours at day and night and you get to see the most of Brisbane in a short period of time. Green Cabs  are one of the latest additions to the city and growing in popularity. Essentially a rickshaw, they are a novel way of getting around the inner-city areas. Able to accommodate up to 2 adults and 2 small children (though it can vary - talk to the rider and see what you can arrange), they mostly operate between West End, South Bank, the CBD, Fortitude Valley and along the river where it's mostly flat, although you can arrange to be taken elsewhere. Prices start at $5 and tours are available. CBD roads become clearways at 4PM, and any cars parked on the side of the road will be fined, towed or both. You have to pay for the towing to get your car back, and then they expect a fine to follow in the mail. Check for signs when parking, or just play it safe and find a parking station. An area of roads around the CBD are covered by the 'Brisbane Central Traffic Area', meaning that parking on unmarked roads is limited to 2 hours between 7am and 5pm on weekdays and before noon on Saturdays. More information including a map of the area affected can be found on the Brisbane City Council website. Brisbane Central Business District (CBD) is not the friendliest of places when it comes to finding a parking spot for your car. Leaving your car for an hour could cost you in excess of $25 or a few parking fines. The best way to get around the CBD is either by scooter, motorbike. Motorbike and scooter parking is free and there are plenty of areas designated for parking of motorbikes, scooters and Mopeds. Mopeds, however, are not allowed on major highways. Even though they can be ridden by just about anyone who holds a car drivers license, it is difficult to see all of Brisbane on a moped as most major streets are zoned as 60-80 km/hr and the standard 50cc mopeds are limited to 55 km/hr. Taxis are numerous throughout Brisbane and can take you anywhere. The major companies are Yellow Cabs  and Black & White Cabs . All cabs can be hailed down no matter where you are, provided their roof light is on, though in some areas they might not be able to stop, so it might be best to book one in advance. All cabs accept cash, credit and debit cards. Despite cabs being fitted with GPS units, you'll find it wise to check with the driver about your destination before departing and make sure they are willing to go there. In the outer-suburban areas, cabs will pull over if you hail them down from the side of the road and can be found in designated taxi ranks in shopping centres, or near bars and pubs. The same can be said for the inner-city, however taxi ranks are more common and it's usually best to catch a cab from there. At night though, especially on Friday and Saturday, taxis exclusively pick up passengers from these ranks and you'd be extremely lucky if you get one elsewhere. These ranks are usually monitored by security and have ushers at night. Between midnight-5:30AM on Friday and Saturday nights, all taxis from the CBD and Fortitude Valley become "FlatFare", meaning that there is a fixed price for any given destination and you will have to pay before entering the taxi. Taxis can be expensive in Brisbane; a trip between the airport and the city can be in excess of $50-60 and can easily run to over $100 if you go beyond the central Brisbane region. The three main public transport options of Brisbane (ferries, buses and trains) are linked by a common ticketing system, known as TransLink. This coordination arrangement allows free transfers to be made between the three different transport modes, providing relevant time and zone restrictions are met. The TransLink website  (13 12 30) is handy for researching public transport options between destinations, and is essential for Brisbane visitors planning their commute. TransLink has integrated ticketing called the go card , a contactless smart card which you purchase before travelling and you top-up with funds. The fare is deducted as you touch-on and touch-off as you board and leave public transport. Buses and CityCats/Ferries are fitted with go card machines that are apparent when you board, whilst train stations have external panels located on the platform or nearby. A deposit of $10 applies when purchasing a go card. Go cards can be purchased and topped up online, or from staff at train stations, some ticket vending machines and selected newsagents and convenience stores, of which there are many in the city centre. Buying a go card removes the hassle of figuring out zones. Fares are discounted by 30%, and once you make 8 journeys with a go card during a Monday to Sunday week, then the travel is half-price until Sunday. Obviously, this works best if you arriving on a Monday. Translink uses the word "journey" to mean end-to-end journey including any required transfers, and the word "trip" to mean the leg of travel on one vehicle. A journey can be made up of one or more trips. When making a number of trips to get to your destination it is still one journey if you touch on within 60 minutes of touching off on your previous trip. Getting a go card will save you around 50c to $1 on the average journey. However, getting a refund for the unused money and $5 deposit can be a hassle. If you have paid by credit card you need apply and have the money returned by cheque or by transfer to an Australian bank account. If you have paid by cash you can get a refund at a train station, including the airport train station. For a 3 or 5 Day Trip In Brisbane a SEEQ Card  may be better then getting a go-card. Unlike the Go-Card where fares are based on a pre-paid system and you pay for what you use, the SEEQ Card allows for Unlimited Trip on Translink Buses, Trains and Ferries. The fare you pay will depend on public transport "zones" . The 8 zones form concentric rings and propagate outwards from the CBD (zone 1). All official public transport maps clearly mark the zones and zone boundaries. Generally speaking, most major attractions around the inner-city are within zones 1. Your fare is determined by how many zones you travel through. Travelling between zones 2 and 3 will cost you the same fare as travelling between zones 7 and 8. You must observe the time restrictions for transfers to avoid having to pay for another journey. 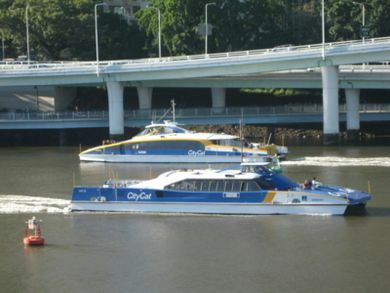 CityFerries and CityCats have become an icon of the city and are fantastic ways to tour Brisbane along the river. The CityCats are high-speed catamarans with stops at South Bank and the city centre as well as many riverside suburbs, and are a very popular method of getting around for tourists. CityFerries are more traditional ferries which generally operate shorter routes with more frequent stops; you may end up on one if you must use one of the smaller terminals, but in practice, most riverside destinations are accessible from the faster and more modern CityCats. The red CityHopper ferries that operate in the city centre are free of charge, whereas the regular blue ferries attract a fee according to the above mentioned zones. Brisbane has a large network of bus routes. Virtually all buses have a digital display of their route number and destination(s). The inner city areas are well serviced by buses, with the most popular routes running from 6AM to 11PM as a minimum, and most routes ultimately terminating at Queen St Bus Station, Fortitude Valley (via Adelaide St or Elizabeth St) or on the busway. In some of Brisbane's notoriously dispersed outer suburbs, services may be less frequent or have reduced running hours, so it is advisable to check timetables if making these trips. Brisbane's dedicated busway runs from a corridor in the southern or northern suburbs, through South Bank and the central business district. If you are unfamiliar with the geography of Brisbane, use of the busway is recommended where possible. The busway and rail network meet at Roma Street station, and the two combined provide very good coverage of the key inner city areas. Drivers carry notes with them, but not always many or of high value. If you must pay cash, try to pay the correct amount and with coins where possible. Some services, especially in peak hour, do not sell tickets onboard and only accept pre-purchased tickets or go cards. These are signed with the letter 'P' before the route number. Brisbane has express buses: not all buses observe every stop. In peak hour there are more express routes ("rockets" and "bullets") for commuters which make very few stops. Ask the driver if you are unsure. The 'Brisbane City Loop'  is a free and convenient bus service travelling in both directions around the CBD. Operating M-F 7AM–5:50PM, every ten minutes from any distinctive red CBD bus stop. The 'Spring Hill Loop'  free bus operates approximately every 10 minutes between 8:10AM and 6:05PM and stops at distinctive yellow bus stops. The 'CityGlider'  bus operates as a prepaid service for quick cross-city travel between West End and the Teneriffe Ferry at Newstead, just beyond Fortitude Valley. It runs every five minutes during peak hour (weekdays from 7-9AM and 4-6PM), and every 10 to 15 minutes between all other hours of operation. It operates from 5.30AM until 11.30PM Sunday to Thursday, and 24 hours Friday and Saturday from any distinctive light blue bus stop. The 'CitySights'  bus service is a hop-on, hop-off bus service for getting around to popular sights and attractions in Brisbane. It is operated by Brisbane City Council, but is a premium service and not covered by TransLink tickets or go cards. A day pass is currently $35 and includes free CityCat travel. The routes 598 and 599  form the Great Circle Line which circles the city in clockwise and counter-clockwise direction and can be a great way of getting around the different suburbs. The 'CityHopper'  is a free hop on and hop off ferry service that runs every 30 minutes from 6am to midnight, seven days a week. The service covers the inner city reach of the Brisbane River. The CityHopper is identifiable by its red colour and markings which include a hopping kangaroo. Brisbane City Hall and King George Square, Located between Adelaide and Ann Streets, this is the city's most significant historical landmark. Museum of Brisbane, . Ground Floor, 157 Ann St. 10AM-5PM daily, free. Features one floor of exhibits about the history of the city, and another floor for exhibitions of local artists. City Botanic Gardens, 10-15 minute walk from the city centre and Central or Roma Street railway stations. Walking and cycling tracks. Exhibits. Open 24 hours. Free. Free guided tours M-Sa 11AM and 1PM, 1 hour. No need to book ahead. These tours are a mix of the history of the gardens and the city whereas the garden tours at Mt Coot-tha are more focused on the wide variety of plants. Commissariat Store, one of Brisbane's oldest buildings, showing exhibitions about the city's history. 115 William Street. 10AM to 4PM tuesday to friday, $7 adults, $5 children/concession. Courier-Mail Piazza, Within South Bank often hosts free live events and movies. Queensland Cultural Centre, Adjacent to South Bank, the site includes The Queensland Performing Arts Centre , Queensland Museum , Queensland Art Gallery , Gallery of Modern Art (GoMA) and State Library of Queensland  - located on Grey St in South Brisbane. The Queensland Conservatorium  and the Queensland College of Art are also located on Grey St. The recently opened GoMA regularly hosts exhibitions featuring internationally famous artists (such as Warhol and Picasso) as well as many local contemporary artists. The Cultural Centre has its own busway stop and can be accessed by a large number of different routes. Wildlife HQ, formerly Queensland Zoo, . Located one hour north of Brisbane at the Big Pineapple in Nambour. If taking public transport there's a bus from the Nambour train station that goes to the zoo. Admission: adults $28, children 3-13 yrs $15, discounts for students, seniors and families. Parliament House and Old Government House, two elegant historical buildings from the 1860s. At the border of the City Botanic Gardens. Tours available. Lone Pine Koala Sanctuary, . 15 minutes drive from the city on Jesmond Road in Fig Tree Pocket (via the Western Freeway). Catch the hourly 445 or 430 buses from the city or the Mirimar boat cruise from South Bank at 10:20AM. +61 7 3378-1366. World's first and largest koala sanctuary, with over 130 koalas. Cuddle a koala, hand feed kangaroos and see some other Aussie wildlife. Admission $32 adults, $21 children 3-13 yrs, with discounts for families and students. Maritime Museum, featuring exhibitions on Queensland's maritime history as well as several vessels on the river and a dry dock, the largest being the HMAS Diamantina which was a warship during World War Two. Mt Coot-tha, . Brisbane's tallest mountain. A popular make-out spot with a great view and good but overpriced cafe and restaurant. Also home to one of the Botanical Gardens and a Planetarium. Approximately 6km west of the CBD. Large TV and radio antennas lining some of its broad peak. You can take a scenic drive through the heavily forested Mount Coot-tha Reserve to the peak to see the almost-360° views of Brisbane and the surrounding region. Also features the Brisbane Botanic Gardens and Planetarium and numerous walking and bicycle tracks. The mountain is 287 m (941 ft) above sea level and forms the eastern extent of the Taylor Range. It is the most northern part of Australia to record snow. It is a prominent landmark approximately 6 km (4 mi) to the west of the Brisbane central business district and is visible from much of the city. Before the Moreton Bay penal settlement, Mount Coot-tha was the home of the Turrbal Aboriginal people. Early Brisbane people called it One Tree Hill when bush at the top of the mountain was cleared except for one large eucalypt tree. The Aboriginal people of the area used to come to the mountain to collect ‘ku-ta’ (honey) that was produced by the native stingless bee. Mount Coot-tha (Place of Honey), a derivative of (the indigenous term), replaced the former title ‘One Tree Hill' in 1880 when the area was declared a Public Recreation Reserve. Car is the most effective way to enjoy Mount Cootha at your own pace. There is ample parking at the peak. One can also hike the marked trail from the mountain's foot. See one of the best views of Brisbane. It is best to arrive just before dusk or dawn so you can enjoy the transition from day to night. Drive to the peak for a picnic dinner and admire the views. There are several walking tracks through the forests that surround the summit; some are difficult. Old Windmill, Brisbane's oldest surviving building (1828). Not open to the public. Wickham Terrace. Roma Street Parklands,  - is the world's largest subtropical garden in a city centre and home to 1,800 unique species of plants. Experience the theme gardens such as the topiary maze, rain forest walk, lake, celebration law and amphitheatre with many public artworks to admire. Free admission. Sir Thomas Brisbane Planetarium, . Located in the beautiful subtropical Brisbane Botanic Gardens, Mt Coot-tha Road, Toowong. Open Tu-Su with free admission to astronomy and space displays and a mini theatre. Admission fees (generally $14.10 per adult, with discounts for families) apply to the Cosmic Skydome which features a wide variety of astronomy and space programs. All shows feature a "live" segment recreating the current Brisbane night sky. On weekdays (closed M and public holidays), the doors open at 10AM with school shows at 10:30AM and noon. Members of the public are welcome to attend the earlier school shows when space permits (children must be school age). The 1:30PM and 3PM sessions (Tu-F) are public programs, although the 1:30PM program may be booked for dedicated school programs (please check with the Planetarium's Booking Office). During Queensland school holidays there are extra public shows on weekdays. On weekends, the Planetarium opens at 11AM and shows are also presented on Saturday night with "Saturday Night Live" at 6PM being a very popular show. There is a shop with a wide variety of astronomical/science merchandise and souvenirs. There is free parking, an adjacent bus stop and a separate cafe/restaurant. The Botanic Gardens has many walks. University of Queensland, One of Australia's oldest and most prestigious institutions situated on a bend of the Brisbane River. Its majestic sandstone buildings are surrounded by ornamental lakes, Jacaranda lined boulevards and some of the finest architecture. Visitor attractions include the Great Court, the UQ Art Museum at the James and Mary Emelia Mayne Centre, the Eleanor Schonell Bridge, the Schonell Theatre, the lakes and Wordsmiths Bookshops. The university can be reached by bus from George St on bus numbers 412 and 109 or via the City Cat. Wheel of Brisbane, (at South Bank), , A ferris wheel that allows you to observe the city from 60 m with views across the Brisbane River. The trip is a 15 minute ride in an enclosed, climate controlled gondola. 10AM-10PM daily, $15, $10 children 12 years and under, $2 children aged between one and three. Kangaroo Point,  - the walls along the Brisbane River are a popular spot for rock climbers and give an excellent view of the CBD skyline just across the river. Activities carry on after dark, when the walls are well-lit. Abseiling and rock climbing classes on the cliffs with an instructor are available from Riverlife Adventures, as well as kayak, kick-bike, rollerblade and bicycle hire. There are also barbecue and picnic spots in the area. Wild Dolphin Feeding Day Cruise to Tangalooma,  - Take a 75min cruise to Moreton Island, to partake in the Wild Dolphin feeding experience on the shores of Tangalooma Resort each day. Story Bridge Adventure Climb,  - offers the opportunity to scale the top of Brisbane's iconic bridge. Enjoy 360° views of Brisbane, the mountain ranges and Moreton Bay Islands at dawn, afternoon or night. Jan Powers Farmers Markets, . Buy fresh fruit, vegetables and cuts of meat from one of the many farmers markets across Brisbane including the Powerhouse at New Farm, Manly, Mitchelton and the newest market at Reddacliff Place at the top of the Queen Street Mall. Balloons over Brisbane, Gain an aerial perspective as you float over Brisbane in our hot air balloon. It's often possible to see as far off as the magnificent Glasshouse Mountains, to the Gold Coast and out to the islands of Moreton Bay. Explore Brisbane's Moreton Bay and Islands , 25 km (16 mi) from the Brisbane's CBD and stretches from Bribie Island to the Southern Bay Islands. Enjoy sand tobogganing, 4wheel driving, diving or snorkeling or go marine watching and spot turtles, dolphins, dugongs and even whales. Explore Greater Brisbane Country, . Take a day trip to the surrounding regions around an hour from Brisbane and discover wineries, national parks, lakes and country living. The Scenic Rim including Ipswich, Beaudesert and Boonah is a vast region of mountains, rainforest and valleys embracing the World Heritage wilderness of the McPherson Range. The Lockyer Valley provides a perfect blend of town and country living, with experiences ranging from guided tours and bush camping to hot air ballooning and sky-diving. The Scenic Rim,  - This describes the large arc of mountains, to a height of 1,375 m (4,511 ft), from the Mistake Ranges (south of Gatton) across the Main (Great Dividing) Range to the MacPherson Range that terminates at Currumbin on the Gold Coast. Apart from some well known locations on the Rim, such as Binna Burra and O'Reilleys guesthouses, Springbrook and Cunningham’s Gap, the largest proportion of these ranges are unspoiled and much of it near-wilderness. Many forest areas were previously logged, but the forest recovery has been excellent, and virtually all the logging tracks have disappeared except for those still used for foot access. At the previously mentioned sites, graded paths offer a taste, but for the more adventurous there are many hiking possibilities from day trips to sustained multi-day exercises. More information can be found on the web. Parties should be properly prepared and conversant with navigation in difficult country and the rules of National Parks. Riverlife Adventure Centre, . Brisbane's riverside adventures. Kayaking, Abseiling the Kangaroo Cliffs, a rollerblade session and bike rentals. They also organise evening activities such as Kayak paddle and prawns. Bosky Bike Hire, . Explore the cities landscape on a bicycle. With each bike you also obtain a community card which entitles you to discounts at various cafes, attractions and retail stores throughout Brisbane. Brisbane Free Tour, . Enjoy a Free sightseeing walking tour of Brisbane with local guides. No booking required, just show up at Queens Gardens. Check website for times. Walk Brisbane,  Walk Brisbane offers small group (maximum 8) walking tours around Brisbane. Ideal if you enjoy architecture, art, restaurants, stories, design, history, gardens, coffee or just want to meet some locals. Check website for more information. By far the largest and most popular event in Brisbane is the annual Brisbane Festival . This festival, which originally started as a celebration of the Brisbane River, now incorporates a number of smaller events at various places around South Bank Parklands, the Cultural Centre and the CBD as a celebration to Brisbane itself. Notably the 'Riverfire' event which is held in South Bank every September and draws the largest crowd. It offers free family entertainment all day and the city's biggest Fireworks display at night. The annual Royal Queensland Show or The Ekka  as it's almost exclusively called by the locals is a staple event in Brisbane's history and culture, held every August and dating back to 1876. It is hosted at the RNA Showgrounds in the inner-suburb of Bowen Hills and runs for a week, where the Wednesday is a public holiday (so expect large crowds on this day). Primarily marketed toward families, attractions at the Ekka include fairground rides, a Side Show Alley, animal parades, wood chopping competitions, agricultural displays, equestrian events and Showbags, usually containing food items (such as confectionery) and novelty items. If you are in Brissy at the time, it really is not to be missed! The Brisbane Powerhouse , renovated from a decommissioned power station, is an arts and cultural hub located in the Brisbane suburb of New Farm, Queensland, Australia. The venue offers an array of performing arts, visual arts, festivals, and free community events along with dining and drinks at Bar Alto or Watt Restaurant+Bar. In Musgrave Park, the Greek Paniyiri Festival  is another popular family entertainment event. Brisbane has a large Greek population who come out in force to celebrate Greek culture. Offers authentic Greek foods and entertainment. If you are looking for what's happening in Brisbane, most music and entertainment stores as well as some hipster restaurants and cafés offer free entertainment magazines like Scene  that list what's coming up within the next month or so. Black Bear Lodge  322 Brunswick St, Fortitude Valley - tucked away above street level in the Brunswick Street Mall, this stylish candlelit speakeasy venue is the perfect place to enjoy a drink and gig. Max Watts  125 Boundary St, West End - funky, purpose-built live show venue located in the heart of Brisbane's alternative district. The Tivoli  52 Costin St, Fortitude Valley - has a very relaxed, noir-styled interior with sizable floor space and a mezzanine. Highly rated venue amongst locals and only a 10 minute walk from The Valley. The Triffid  7-9 Stratton St, Newstead - an old World War II US aircraft hangar converted into a modern music venue by former bassist from the internationally-renowned Brisbane band, Powderfinger. The Zoo  711 Ann St, Fortitude Valley - this live music venue is almost more Brisbane than the river. Indie rock, hipsters and that alternative vibe. The Valley Fiesta  is an annual three-day event. It was launched by Brisbane Marketing in 2002 to promote Fortitude Valley as a hub for arts and youth culture. It features free live music, market stalls, food and drink from many local restaurants and cafés, and other entertainment. Westfield Carindale, . edit The largest shopping centre in the Eastern Suburbs. Ann St Along Ann Street in the Valley there are many independent fashion boutiques for mid-range shopping. Some of them are spread out around the corner of Brunswick Street too. Beach House, ☎ +61 7 3003-0017 Located on the corner of Albert and Elizabeth St, Myer Centre, 2F. Licensed bar, large meals and live entertainment at value for money. Bar Merlo, . Various outlets throughout the city, their first being opened in the QUT Gardens Point campus. Regarded as one of the leaders in the Brisbane café society boom since the 90s, their coffee is served at countless cafes and restaurants throughout Brisbane. Kadoya Elizabeth St Arcade. Famous for their authentic Japanese curries. Little Tokyo 85 Bowen St, Spring Hill. ☎ +61 7 3831-7751, . Oldest Japanese restaurant in Brisbane, under same ownership for over 40 years. Authentic food and decor but at upper-range prices. Pane e Vino, Albert St, ☎+61 7 3220-0044, . Italian restaurant with pastas and mains $18-34. Not a lot of authentic Italian ambiance as found in more typical restaurants further south in Melbourne. Sono, Queen Street Mall, ☎ +61 7 3220-1888, . Authentic Japanese food. Has a second outlet in the new Portside precinct in Hamilton. ARIA Brisbane, , 1 Eagle St, ☎ +61 7 3233-2555. The sister restaurant to the famed ARIA Sydney, ARIA Brisbane is no less impressive, with a commanding view of the River and the Story Bridge. Located in the Eagle St Pier precinct, it specialises in the freshest Australian produce. Alchemy, , ☎ +61 7 3229-3175. Located in a little hideaway on Eagle St, this restaurant has one of the most impressive views in Brisbane, looking across the river to the Story Bridge. Well known for its "liquid nitrogen nibbles", Alchemy lives up to its name. Cha Cha Char  Pier Ave, ☎ +61 7 3211-9944. 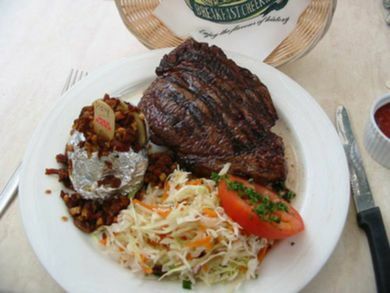 Famous award-winning steakhouse located at the Eagle St Pier precinct. Their steaks are considered one of Australia's best. Recently opened is Organic Char, the sister restaurant to Cha Cha Char which serves organic produce. E'cco Bistro  100 Boundary St, ☎ +61 7 3831-8344. Founded and run by the internationally renowned and acclaimed chef Philip Johnson, it is one of the best restaurants in Brisbane and Australia-wide. Esquire,  145 Eagle St, ☎ +61 7 3220-2123. Recently opened by executive chef Ryan Squires, who trained at Noma in Copenhagen, this restaurant is famed for its degustation menu. An immediate hit in Brisbane. Don't go dressed in shorts and a t-shirt. Many an unsuspecting Brisbanite has attempted to get in, yet even in the height of summer they still enforce the strict dress rule. Il Centro, 1 Pier Ave, ☎ +61 7 3221-6090, . Located in the Eagle St Pier precinct, along with other notable neighbours. Famed for its signature sand crab lasagna, it is one of the most popular Italian restaurants in Brisbane and also among the priciest. Moda, 12 Edward St, ☎+61 7 3221-7655 . Huge selection of wines and a varied menu including seafood, duck, rabbit and pork cheeks. By no means cheap but amazing food. Restaurant Two, Corner of Edward and George St, (across the street from the Botanic Gardens), ☎ +61 7 3210-0600, . Headed by executive chef David Pugh, it is widely regarded as one of Brisbane's best restaurants. Sake, Eagle St Pier, . Recently the recipient of an Australian Gourmet Traveller star, and selected as one of Australia's 100 Top Restaurants, Sake is one of the hot newcomers to the Brisbane restaurant scene. Serves Japanese Cuisine. Tank, Tank St, ☎ +61 7 3003 1993. Another member of the top 100 Restaurants in Australia, Tank also served Japanese-Australian cuisine in a tucked away spot in a little laneway off Tank St, in the North Quarter of the Brisbane CBD. Urbane, Mary St, (Short walk from Stamford Plaza), ☎ +61 7 3229-2271. One of the best fine dining restaurants in Brisbane, serving unconventional but innovative food. Bank Vault Lounge, Brunswick St Mall, ☎ +61 7 3252-3424. . Wood Fired Pizzas, alfresco dining. Continental Cafe, 21 Barker St, +61 7 3254-0377, . Good food, nice atmosphere across several rooms, surprisingly good children's menu. Open for dinner 364 days a year. Watch out for the offal specials on Tuesdays. Reliable high quality. Enjoy Inn, 167 Wickham St, (corner of Duncan St in Chinatown) ☎ +61 7 3252-3838. One of the longest established restaurants in Brisbane, good Chinese food. Fatboys Cafe 323 Brunswick St, +61 7 3252-3789. The cafe portion of Ric's Bar, on Brunswick St Mall. Serves some of the best value for money breakfasts in Brisbane from $4. Freestyle Tout, 1000 Ann St, ☎ +61 7 3252-0214. Popular dessert restaurant located in the Emporium, with a sister restaurant that is first established in the Rosalie shops in Paddington. Green Tea Restaurant, 31 Duncan St, (Duncan St in Chinatown mall), ☎ +61 7 3252-4855. Good authentic Vietnamese food at a reasonable price. Harvey's. (James St precinct), ☎+61 7 3852-3700, . Very popular cafe restaurant and deli. It is located a short walk from James St market. Hunan Chinese Restaurant , (Chinatown Mall). Unpretentious eatery serving exotic regional Chinese fare from the Hunan province, as well as Chinese takeaway staples at cheap and reasonable prices. King of Kings, Wickham St, (Chinatown precinct), ☎ +61 7 3852-1122 . A Brisbane institution for yum cha, decent food and prices. Mecca Bah, 1000 Ann St, (Emporium precinct), ☎+61 7 3252-5299, . Popular restaurant that serves modern Middle Eastern food, part of an Australian interstate franchise that originated in Melbourne. Mint Indian Gourmet, Brunswick St, (near the Central Brunswick precinct), ☎ +61 7 3252-0300. Indian restaurant that serves traditional curries as well as gourmet dishes at upper range prices. Re Del Gelato, ☎ +61 7 3358-2177. Beautifully made Italian gelato, a perfect cap after a nice meal at one of the close by restaurants on Brunswick Street. James Street Market, . Not a restaurant, but a yuppie grocery where you will find all the food and drink you need to bring with you in the bush. Taj Mahal, 722 Brunswick St, (opposite Village Twin Cinemas), ☎+61 7 3254-2388. Amazing Indian cuisine. Caterers to the Indian Cricket Team when in Brisbane. Thai Wi-Rat, 20 Duncan St, (on Chinatown Mall), ☎ +61 7 3257-0884. Cheap and cheerful authentic regional Thai-Laotian cuisine. Vespa Pizza, 148 Merthyr Rd, (corner of James St), ☎ +61 7 3358-4100, . Woodfired pizza restaurant on the. Serves the tastiest pizzas in Brisbane and is BYO. Cozy atmosphere in the fairylight-lit courtyard outside and room to move in the booths inside. Delivers to local area on Vespa scooters. Ahmet's Turkish Restaurant, Little Stanley St, ☎ +61 7 3846-6699. Turkish restaurant, features belly dancers on weekends. One of the most popular and busiest restaurants in the South Bank precinct, though the painstaking quality of the kitchen means a longer than usual wait for food. Do not expect to be in and out in less than an hour. Brisbane German Club, 416 Vulture St, (opposite The Gabba stadium), ☎+61 7 3391-2434, . Located directly, this restaurant/bar offers a wonderful range of authentic German cuisine and beer for very reasonable prices. Green Papaya, 898 Stanley St , ☎ +61 7 3217-3599, . Formerly a French-influenced Northern Vietnamese fine dining restaurant founded by renowned chef Lien Yeomans, it is now run by the Mons Ban Sabai management and serves Thai and Indonesian food. Norman Hotel, 102 Ipswich Rd, Woolloongabba. ☎ +61 7 3391-5022, . Along with the Breakfast Creek Hotel, possibly the best steaks in town, it's slogan is "Brisbane's worst vegetarian restaurant". China Sea, 60 Park Rd, (on the Coronation Drive end of Park Road), ☎ +61 7 3367-0198. Excellent Chinese food at upper-range prices. Royal Thai Orchid 45 Little Cribb St, (off Park Rd), ☎ +61 7 3229-2588, . Thai restaurant. Its sister restaurant in the outer suburb of Springwood was the first Thai restaurant in Brisbane. The Lure 28 McDougall St, (at the Coro Hotel on Milton Rd), ☎+61 7 3369-9955, . Well-known for their well prepared seafood. Gambaro's, 33 Caxton St, ☎+61 7 3369-9500, . Has both a seafood restaurant and a long-established seafood takeaway. A Brisbane institution. Montrachet, 224 Given Terrace, . French bistro specializing in Lyonnaise specialties, regarded as one of Brisbane's best restaurants. Sultans Kitchen 163 Given Ter, ☎ +61 7 3368-2194, . Among the best Indian food in the city. Fresh and tasty and good service. Usually fills quickly and does a roaring take-away trade, so get in early. Tomato Brothers ,19 Nash St, (Rosalie shops in Paddington), ☎ +61 7 3368-1601, . Renowned for their wood fired pizzas, with several franchises in several Brisbane suburbs such as Wilston and Clayfield. Urban Grind,530 Brunswick St, LaTrobe Ter, ☎+61 408 101 140, . Small café with a BYO food policy, great coffee and free WiFi. For those who wish to indulge in a guilt free cup of coffee Urban Grind is committed to being climate neutral and use Barambah organic milk in their fantastic coffees. Suburban West End, 220 Melbourne St. One of the highest rated in town. Excellent breakfast/brunch. Eggs benedict from $10 on weekdays. Open daily until 3pm. Fantastic coffee. Lefkas Taverna 170 Hardgrave Rd, West End, ☎+61 7 3844-1163. Brisbane's most famous Greek takeaway and restaurant. Makanan Indonesia, 59 Hardgrave Rd, ☎ +61 7 3846-2111. Authentic Indonesian fare at unbeatable value. Punjabi Palace, 135 Melbourne St, South Brisbane, ☎ +61 7 3846-3884, . Arguably one of Brisbane's best Indian restaurants. Trang, 2/59 Hardgrave Road West End. Did someone say Pho? Head here for possibly the best Pho is Brisbane. Give the chinese menu a miss. Gandhi Curry House, s/10 Little Stanley St South Brisbane, (www.gandhicurryhouse.com.au) ☎ +61 7 3844 1997 Celebrating 10 years of authentic Indian cuisine in Brisbane's South Bank. Blue Lotus, Kelvin Grove Urban Village precinct, . Gourmet and exotic ice-creams that change according to the seasons. Breakfast Creek Hotel, 2 Kingsford Smith Drv, (in the Newstead area)., ☎ +61 7 3262-5988-. Famous for its steaks, a Brisbane institution. 'The Courthouse Restaurant,' 1 Paxton St, Cleveland, ☎ +61 7 3286 1386 - [www.courthouserestaurant.com.au]. A Redlands institution, situated in an 1850's Courthouse, this restaurant offers quality food in a stunning heritage building with beautiful views of Moreton Bay. Efes One Turkish Restaurant, 293 Sandgate Rd, (off Sandgate Road at Albion), ☎ +61 7 3862-4599-. Brisbane's first Turkish restaurant. 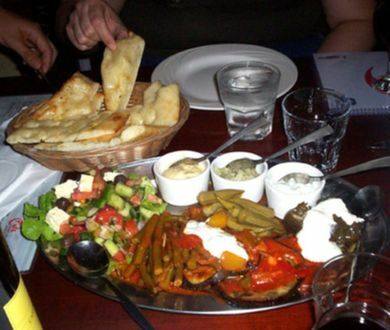 Without a doubt the most popular destination for traditional Turkish cuisine and a friendly atmosphere in Brisbane. Belly dancers on Friday and Saturday nights. Landmark, Shop/101 Cnr mains Rd, (Sunnybank Plaza business precinct), ☎ +61 7 3344-3288. One of the most renowned and popular Chinese restaurants in Brisbane, notably for its well done authentic yum cha. Sitar, (next to Bespoke in the Albion area). . Indian restaurant that has franchises in suburbs like West End and New Farm. 'Laksa Hut, Indooroopilly. Best Laksa and Chinese-Malay food in Brisbane. Ho-fun and salty chicken and fish are good too. Strauss, 189 Elizabeth St. Great coffee and food. It is down the alleyway behind the TAB. Suburban West End 220 Melbourne St. One of the highest rated in town. Excellent breakfast/brunch. Eggs benedict from $10 on weekdays. Open daily until 3pm. Fantastic coffee. The Gunshop Cafe 53 Mollison St, ☎ +61 7 3844-2241. Possibly the best French toast in the city. Fantastic coffee. Paladar, Cnr Fish Lane & Merivale St. Devised by connoisseur Filip Pilioras, Paladar Fumior Salon is a must for lovers of Cuban coffee, culture and cigars. Despite having a small street frontage and being tucked away off a main street (Merivale St on the corner of Fish Lane) the bright red exterior makes it easy to find once you are in the area. Three Monkeys, 58 Mollison St– Throughout the ground floor and garden of a converted house, this eclectic cafe is an enchanting maze of exotic furniture, fabrics and nooks. A Brisbane icon for over 20 years, you can enjoy meals, desserts and of course, tea and coffee, here 7 days a week. The Fox Hotel, Melbourne St, ☎ +61 7 3844-2883. Has a number of wonderful art deco bars and a signature restaurant serving true Italian ristorante style cuisine, luxurious banquet seating, opening roof and euro-style street side dining. Uber, 100 Boundary St. Only open for dinner, 4pm to 4am. The JoYnT, 48 Montague Rd. Small coffee shop in South Brisbane. Jam Jar Boundary St, great coffee and food, al fesco dining area. Also sells artworks. Lock'n'Load Boundary St, really good coffee and Australian cafe food. Some of the best breakfast on Boundary St.
Atomica Nice smaller cafe on Boundary St, good coffee and nice eggs benny. Also sells Phoenix soft drinks which are amazing. Desmond and Molly Jones, 615 Stanley St, ☎ +61 7 3391-8594. Café with exposed brick walls, a hodge-podge of vintage seating, and excellent iced chocolates. Bunker Coffee, 21 Railway Tce, Tiny café set in a World War 2 bomb shelter covered with creeping fig. Specialty coffee and real hot chocolates with over 12 flavours. Campos, 11 Wandoo St, ☎+61 7 3252-3612, . Sydney-based café/roastery. Located behind the popular Fresh on James Street markets. But please note that you cannot access this directly from James St Market you need to go around the complex to get there is a sign that points you the way. Anouk, 212 Given Tce, ☎ +61 7 3367-8663. Open daily 7AM-2.30PM. Sophisticated atmosphere and the perfect place for brunch. On weekends you may have to queue for seating. Jetty Kiosk, William Gunn Jetty, Manly Esplanade, (behind the Manly Baths swimming pool). Cafe owned by the Port of Brisbane. Open 7 days, from 9AM-4PM, Sit over the water enjoying a drink, dessert or meal and admire Moreton Bay. Peaceful. Cafe da Vinci, 50 Cambridge Parade, Manly, ☎ +61 7 3396-2069. Sit on the wooden deck of this bayside cafe and admire the harbour. Serves drinks, meals, great breakfasts, and desserts. Open 7 days, dinner only on Thu, Fri and Sat. Not the best breakfast in Manly. Brisbane's drinking and nightlife scene is separated into some distinct areas. Anyone planning a night on the town should be aware that after 3AM no more patrons are allowed into pubs and clubs. This is a safety measure, coupled with increased security presence at taxi ranks. Additionally, smokers should beware of strict anti-smoking regulations. Smoking is now banned in 'all areas where food & drink is served', both indoors and outdoors. This means that smoking is banned in all hotels, clubs, and cafés except in designated smoking areas. The drinking age is 18 and only an Australian or New Zealand license or 18+ card, or a foreign passport is accepted as proof of age. Other forms of ID such as a student card are not accepted. These regulations are strictly enforced - for nightclubs in particular your ID will always be checked at the door, and while venues serving food may let you in, most are very prudent in checking ID if you wish to purchase alcohol. Oxford 152  152 Oxford St, +61 7 3899-2026 - one of Brisbane's most popular suburban restaurant/bar. Chalk Hotel  735 Stanley St, +61 7 3896-6565 - a prominent Brisbane hotel since converted into extremely popular, multi-million dollar, modern southside bar/restaurant. Very popular on Friday and Saturday nights, as well as during/after matches at the nearby Gabba Stadium or special events at South Bank. 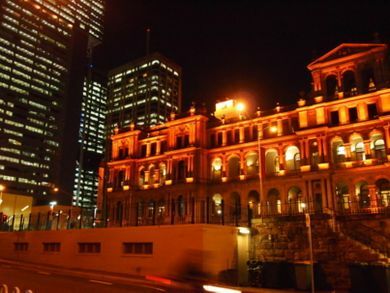 Conrad Treasury Casino 130 William St - Brisbane's casino has a number of bars, from quiet lounges to dance floors. Known for its well-priced daiquiris. Open 24 hours a day (no lockout), though the individual bars vary. Criterion Tavern 239 George St - newly renovated bar, recommended for those who are looking for a quick beer and some country music. Down Under Bar 308 Edward St - A well known haunt for travellers, with a number of pool tables, dance floor and unashamedly little class. Messages left by visitors from all over the world adorn the walls. If you are studying in Brisbane or just backpacking, this is perfect bar for meeting people of other nationalities. Exchange Hotel 131 Edward St – Somewhat popular with a wide, although decidedly young, demographic, including students, young professionals and tourists, who all stream in later in the night after cheap drinks finish at the other hotels nearby. Newly renovated with stylish interior and 2nd floor open roof bar. Fridays 123 Eagle St - a very popular nightclub which also features dining (not recommended after 10PM). Especially popular with the Friday after-work crowd. Smart dress code (business style shoes and shirts for the guys), always enforced. Mick O'Malley's Irish Pub 171-209 Queen St - one of the many Irish pubs in Brisbane. Has a reasonable selection of food to enjoy with your pint of Guinness. The Port Office Hotel 38 Edward St - Trendy bar downstairs dance floor upstairs popular spot in Brisbane. Crowed with students on Thursday. The Victory Hotel often referred to by locals as the Vic, it is situated opposite the Exchange hotel on the corner of Edward Street and Charlotte Street. Nightclub and pool tables upstairs and a beer garden and karaoke bar downstairs. The venue is popular on Thursday nights for $3 basic. Fat Louie's -  Fat's is situated at 124 Albert Street in Brisbane City. It is a casual dress venue with occasional live music and DJ sets, however, its speciality is with $3 basic spirits every day between 1700 and 1900: 'Happy Hour'. Lastly, it hosts karaoke and is a pool hall. The Fortitude Valley is a unique area of Brisbane catering to the live music scene. A large number of Brisbane's hippest clubs are located here. Through the 1960s and 70s it was seen as Brisbane's bohemian hub and has maintained a certain degree of that reputation. More recently it is sometimes thought of as being one of the more dangerous areas of the city but this attitude is changing as the area becomes more popular and hence, safer. This however has had an adverse affect on the area's creative vibe as locals turn their back on the area, forcing the creative epicentre of Brisbane to other areas of the city such as West End and Paddington. As with anywhere, simple common sense, caution and courtesy will keep you out of harm's way. Alfred and Constance  Crn Alfred & Constance St, Fortitude Valley - Iconic Queenslander house refurbished into a venue with 4 interconnected pubs, each with a unique, eclectic theme. Includes a restuarant and a late-night desert cafe. Alhambra Lounge  12 McLachlan St - Very stylish interior with a modern Arabic/Spanish theme, young professional and student crowd, good atmosphere and excellent cocktails. Various styles of house music. Located right next door to The Family. Bank - Vault Lounge  Ann St - Party Bar, OK atmosphere, recently renovated, the Vault Lounge is perfect for functions. Outdoor seating available, woodfire pizza and pasta. Barsoma  22 Constance St - Trendy little bar tucked away on Constance Street (off Ann St) offers great cuisine & an array of delicious (& creative) cocktails. On some nights it plays alternative dance music parties. Birdee Num Num  608 Ann St - OK atmosphere, mainly student (popular with this crowd because of the lack of cover charge) and backpacker clientele. Commercial dance music. Bowery Bar  676 Ann St - A small & chic New York inspired bar. Formal/Smart dress code. Amazing cocktails. Cloudland  641 Ann St - Recently opened cocktail lounge on Ann Street with a retractable roof, 10 metre waterfall, 5,000 plants and a glass bar made from 17,000 glass balls threaded by hand. Caters to a very upmarket, sophisticated crowd. Smart dress code which is strictly enforced on busy nights. Club 299 299 Brunswick St - Fantastic if you enjoy metal, emo or any kind of alternative music. Elixir Rooftop Bar  646-648 Ann St - A sophisticated style roof top bar situated above the hustle and bustle of Ann St. This is an atmospheric cocktail bar open to the public seven days a week and provides live entertainment Thursday through to Sunday. Great atmosphere, great drinks and great food. The Empire  339 Brunswick St - alternative dance club, nice long balcony overlooking busy Brunswick Street, a few levels, less pretentious but darker than other dance clubs in Brisbane although no less dangerous. Glass Bar  420 Brunswick St - Vibrant atmosphere, small restaurant & bar/lounge, really expensive drinks. GPO  740 Ann St - Bar and nightclub situated in a former Post Office on Ann Street; trendy spot with great tunes. Laruche  680 Ann Street Fortitude Valley - Laruche offers impeccable service, bespoke cocktails and delectable food located in the heart of the entertainment precinct of the Fortitude Valley. Limes Hotel 142 Constance Street - Rooftop bar and cinema situated above a boutique hotel. Gets busy on weekends with young-professional crowd. Try the mojitos! The Met  256 Wickham St – The biggest club in Brisbane. Host to many international DJs. Amazing decor with great attention to detail. Many different rooms to explore. Although a bit expensive, a huge variety of different types of people inside. The Press Club  339 Brunswick St - Small club with large lounges to stretch out on. Host to funky Jazz blended with dance music. Rics  321 Brunswick St - Live music most nights. The Valley's hipster institution. Venue also includes "Fatboys Cafe", which is a popular restaurant serving breakfast, steaks, pizza and pasta. Royal George (RG) Hotel  327 Brunswick St - Large Beer garden in the Brunswick St Mall, great atmosphere, great food deals most nights. Spanish Tapas Bar  455 Brunswick St - The only authentic Spanish Restaurant in Brisbane that embraces the Spanish food and Culture. The Sangria cheap. x&y Bar  648 Ann St - One of the least pretentious venues in The Valley. There is no strict clothing policy and you're likely to get in so long as you're wearing shoes, long pants and a shirt. Has a variety of music from live bands, DJs and special events. Zuri  367 Brunswick St - Upmarket ambiance, strict door entry conditions regarding clothing and shoes. Male to Female ratio strictly enforced. Quite expensive drinks. Uber  100 Boundary St - opulent, sophisticated & funky restaurant/bar/lounge/dance floor. nice spot, popular with working professionals. Especially popular on Wednesday nights. Archive Beer Boutique  100 Boundary St - located at street level beneath Uber, Archive stocks over 200 different craft beers, primarily Australian. The food is generally excellent, although the menu is in no way as extensive as the beverage list. Prices are reasonable, particularly on Sunday "Beer O'Clock" where the price on the majority of bottled beers are reduced to $5. The Boundary Hotel  137 Boundary St - West Ends oldest pub has recently (2011) completed extensive renovations. This is perhaps the largest drinking establishment in West End, with two bars downstairs and a beer garden & deck on the upper floor. The food is fairly plain but well priced, and the drinks menu is about the same. Excellent live blues acts Sunday afternoon and evenings from Wednesday to Saturday are the main reason to visit. Sling Lounge  153 Boundary St - extremely knowledgeable cocktail staff, with a huge range of drinks on the menu. Bigger than it appears from the outside, you'll find a garden hidden out the back with high ceilings and a great atmosphere complemented by the jazz and lounge music usually playing. It can get busy on Friday and Saturday nights, with a resulting increase in wait times for your beverage. Well worth visiting, especially during quieter times - the staff are more than happy to walk you through the process of making your drinks, including the reasoning behind each individual ingredient being included. Tapas is also available, but prices are a little high considering serving size. Rumpus Room 56 Russell Street - great cocktails, and a good selection of spirits and bottled drinks. The music here is primarily funk and hip-hop, with live DJs on the weekend and during the latter half of the week. The beer garden out the front is a great spot to relax in the shade on a hot day and meet some locals. The crowd tends to be a lot thicker and drunker on Saturday nights, however. Lock n Load  142 Boundary St - friendly staff, live music most evenings and a decent array of cocktails. The beer garden at the back is a nice spot to relax, but is often crowded. Excellent spot for a light meal. The End  73 Vulture St - Calls itself a "boutique bar for everyone". Quite small inside, so if you're not there early you will probably miss out on a seat to 'hipper than thou' types. Decent selection of beers at the average price, ever-changing seasonal cocktail menu. In the past few years Brisbane has seen a surge of interest and activity surrounding craft beer. If vague lagers aren't your drink of choice then there are some great new venues for the hop-head traveller to check out. It is worth checking the Translink  website for the details of the 199 and City Glider buses as they run near a large number of the venues mentioned here. The Scratch 8/1 Park Rd, Milton - 4 taps and lots of bottles. This bar has very friendly and informed staff who will guide you towards beer nirvana. There's generally something to be had on tap for around $6-$8 with bottles extending up to about $50. Free peanuts make the rounds and cheese platters can be purchased. Food from near by restaurants can also be brought in at the possible expense of sharing a slice of pizza with the staff. Kerbside -  cnr Constance and Ann St, Fortitude Valley - 3 taps and lots of bottles. This bar has a laid back feel with second hand furniture (from 'kerbside' collections) in what used to be the drive through bottle shop. Tapas style food is available. Archive Beer Boutique  100 Boundary Street, West End - Arguably has the largest selection of craft beer in Brisbane. Open for lunch Mon-Fri and does your standard pub fare. The End  73 Vulture St, West End - Beers, rum, and cocktails! Bitter Suite  75 Welsby St, New Farm - 7 taps and a moderate range of bottles. Located in a quieter residential back street this cafe offers great food for breakfast, lunch and dinner served with some great beers. Tipplers Tap  5/182 Grey St, Southbank - 11 taps and a moderate range of bottles. With a keg line up that frequently changes and an American street food inspired menu this is a great afternoon retreat. Bacchus Brewing Co. Unit 1, 2 Christine Pl, Capalaba - While not a bar this homebrew supply place also doubles as a micro brewery supplying some of the above venues. Your long journey from the city (approx 23km) will be rewarded with the ability to sample all of the 40+ beers produced by the brewery. Green Beacon Brewery  26 Helen St, Teneriffe - Coming soon a micro brewery and seafood hangout. Cloud 9 Backpackers Resort, 350 Upper Roma St, ☎ +61 7 3236-2333, ‎. Industrial-space conversion, roof terrace with view on Brisbane River and bridges. Nomads Brisbane Hostel (formerly Palace Central Backpackers), 308 Edward St, ☎ +61 7 3211-2433, ‎. A large hostel right across the street from Central Station. It's on the older side, but has a very fun, vibrant and young atmosphere. And it's right over the Down Under Bar, so you haven't far to stumble home. Can be loud and very party-oriented, but it's a great spot to meet people. Somewhere to Stay Backpackers Hostel, 47 Brighton Rd, Highgate Hill, ☎ Free call 1800 812 398. . This hostel has a free shuttle to Southbank and Roma St Transit Centre, but these areas are only a 15 to 20 minute walk from the backpackers. The hostel is made up of one large, old house and a dorm block that is full of long term residents. The kitchen is very small for the size of the backpackers. The pool is dirty, which explains why no-one uses it. The bathrooms are small and few and far between in the old house. The backpackers offers free 15 minutes of internet time if you like them on Facebook and add a Google review. Brisbane hotels are listed in alphabetical order. Hotel Grand Chancellor, 23 Leichhardt St, ☎ +61 7 3831-4055‎. Large chain hotel with courteous staff and nice rooms. Rydges 9 Glenelg Street, South Bank. ☎ 1 300 857 922. In the heart of Brisbane's arts and entertainment precinct, it is the closest hotel to the Queensland Performing Arts Centre. The Brisbane Convention & Exhibition Centre is immediately adjacent to the hotel and downtown Brisbane and the bohemian village of West End are a 10 min stroll away. Bridgewater Terraces, Wharf Street, Kangaroo Point, . Within a few minutes’ walk of Holman Street ferry terminal, Bridgewater Terraces consist of one, two and three bedroom self contained apartments. Large lagoon pool, spa, sauna, gym and barbecue facilities (shared with Quest Bridgewater next door). Quest Bridgewater, 55 Baildon Street, Kangaroo Point, . One, two and three bedroom apartments although more expensive than the Bridgewater Terraces it has great views of the city from some rooms. Quest Bridgewater utilizes the facilities on offer at Bridgewater Terraces. Oaks Lexicon Apartments, 347 Ann Street, Brisbane City, Ph: +61 7 3246 1702 Email:[email protected] . In the heart of the CBD, is in a contemporary building with 1 and 2 bedroom apartments.Facilities and service of a modern hotel but providing a self-contained apartment. Minutes to the Queen Street Mall, Riverside and the Brisbane Convention Centre. There are numerous internet cafes around the CBD. Check this page  for the closest one. Expect to pay around $2-3 per hour, although most places will offer you a discount if you pre-pay a certain number of hours. Free Internet (including wifi) access is available at the Queensland State Library, South Bank in selected areas. The main Infocentre area is quite large and has a number of 30 minute (no booking) and 60 minute (booking required) computers. The 60 minute computers are booked using a queuing system upon arriving at the library (no library card required). The Infocentre also has a very large lounge and desk area for those with their own laptops wishing to use the free WiFi. Printing is $0.10 per page, but requires the purchase of a $2 copy card in addition to the per page cost. The library is also air-conditioned (as one might expect) so is a good place to spend some time during the scorching mid-day heat. Many cafes and hotels provide free WiFi access to patrons. Keep an eye out for signage and use the internet city guide. Most McDonald's restaurants have free WiFi (limited to 50MB per session, no time limit). On trains at night especially on a weekend it's not uncommon to be harassed (not majorly, just verbal annoyance) by ignorant, casually racist bogans. "Get out me country" and so on. (Advice from a local): Crime isn't a major issue for most people in Brisbane. It is generally a case of "wrong place, wrong time" and many crimes are considered out of the ordinary when they occur. Nights: Like most other places, outer suburbs to get more dangerous. It is recommended that individuals walking in these areas at night take precaution or venture within a group. Suburbs to avoid: Most of the dodgy Brisbane suburbs are far away from the common tourist trail and on an international scale, would be considered generally 'safe'. Avoid Bracken Ridge, Brendale, Caboolture, Ipswich, Acacia Ridge, Inala, Goodna, Logan Central, Kingston and Woodridge. Safe outer suburbs include Redcliffe, Wynnum and Shorncliffe. Suburbs to avoid: No inner city 'no go' zones exist, but it's adviseable to avoid parts of New Farm and South Brisbane, particularly near Musgrave Park at night. During the day, this part of South Brisbane is generally safe. Nights (especially Friday and Saturday): Taxi ranks in particular can be a little dangerous due to many frustrated drunks having to wait for cabs. Wait only at ranks that have a security guard. Stay to the well-lit busy streets and never venture off alone, especially down back-streets or far away from a crowd. Especially for females, it is recommended to travel in pairs or groups to avoid any unwanted attention from drunken travellers, especially in the early hours of the morning. Throughout Australia, the number for emergency services (Police, Fire and Ambulance) is 000. When using a mobile or cell phone, the numbers 000 and 112, are free of charge, and connect using any of the available networks. Important! Probably the worst thing that can befall your trip to Brisbane is sunburn and other heat-related issues. The local UV Index is almost always in the extreme rating during the day (10AM-3PM) and precautions should always be taken. Do not be fooled though, even in the cooler months or when it is overcast you can still be affected by UV rays or the heat. Sunscreen, shirts, sunglasses and lots of water are essential. Try to stay in the shade as much as possible. Brisbane provides a base for day trips to explore the southeast of Queensland. The North Coast of New South Wales can also be reached in an hour if traffic is light, but allow up to two hours travel if traffic is heavy or there is an accident on the Pacific Motorway. Queensland Rail also provides extensive services out of Brisbane to the north and south of the city and to the Gold Coast. Glass House Mountains National Park - about an hour north of Brisbane. There is a scenic drive through the mountains with a couple of lookouts, or you can go for a hike - easy or difficult, depending on the mountain. (Mt. Beerwah offers a stern but quick scramble and a good view of the area.) There are a few small roadside shops in the area that sell homemade jams and varieties of macadamia nuts. Beerwah - home of the Australia Zoo , run by the family of the late "Crocodile Hunter" Steve Irwin. Admission is $57 for adults. Sunshine Coast - 90 minutes north of Brisbane, suitable for surfers without the clutter of the more famous beaches to the south. The city of Noosa and several derivatively-named cities (e.g., Noosa Heads, Noosaville) offer short and long-term accommodation, some restaurants and a few stretches of shops aimed at tourists with and without a budget. Sunshine Coast Hinterland - 90 minutes north of Brisbane. Crafts and galleries and cafés and lots of bushwalks and scenic views in the Blackall Ranges at Maleny, Montville, Flaxton and Mapleton. Eumundi - famous markets on Wednesday and Saturday. North Stradbroke Island and South Stradbroke Island - amazing beaches, 4WD and fishing, accommodation, all very close to Brisbane. Moreton Island  - Holiday destination very close to Brisbane. Dive and snorkel Tangalooma Wrecks, whale watching, dolphin feeding, sand tobogganing, 4wd and much more. Fraser Island - World Heritage listed site, offering pristine, unspoiled lakes, dunes, forests and wildlife. Camping is possible, or day-trips can be arranged from Noosa. World's largest sand island. Redcliffe This peninsula located 45 minutes north is famous for its long stretch of beach, friendly locals and excellent food, shops and weather. Gold Coast - famous for being a tourist town, approximately 70km south of Brisbane on the Pacific Motorway. Dreamworld and Whitewater World  - Theme park in the western Gold Coast suburb of Coomera, on the Pacific Motorway. Many large thrill rides including the 'Tower of Terror' and the 'Giant Drop' and roller coasters. There are also child-friendly rides and Australian animal attractions and shows, as well as a Tiger exhibit. Whitewater World is a water park adjacent to Dreamworld and offers the newest technology in water rides. It costs extra to get into, but you can buy a pass that gets you into both parks for a discounted price. Movieworld  - Another theme park near 'Dreamworld' and 'Wet 'n' Wild Water World.' Generally longer, more cinematic and atmospheric rides, shows and attractions. Seaworld  - aquatically-themed park sandwiched on a peninsula between the Gold Coast Seaway and the Pacific Ocean, located in Southport (just north of the Gold Coast.) A few rides, but popular for its impressive animal shows and exhibits. Wet 'n' Wild Water World  - Water park on the Gold Coast, with heated rides and pools for winter. Large number of thrill rides and also mellow relaxation areas. Mt. Tamborine National Park  - extensive areas of National Park plus arts, crafts, galleries and the like, near several forest hikes. There are some excellent fudge shops at the top of Mt. Tamborine that offer generous free samples and a staggering variety of flavours. Surfers Paradise -  - tourist Mecca, and arguably the most upmarket area on the Gold Coast. Located on a life-guarded beach front, host to Caville Avenue, and several shopping malls. Samford Valley - Samford Valley is a beautiful country get away northwest of Brisbane. There is rolling green hills, bush walking, a historic hamlet with lots of cafes, shops, museums, heritage buildings and a beautiful country tavern. This is a great location to take the family out for a day trip to the country, around a 35 minute drive from Brisbane CBD. Ipswich - is situated 40 km west of Brisbane. 45 minutes by road from Brisbane City. Brisbane Skydiving Centre  - offers tandem skydiving and advanced freefall courses. Willowbank. Workshops Rail Museum  - The whole family will enjoy the birthplace of Queensland Rail and enjoy the interactive exhibits at this award-winning museum. North Street, North Ipswich. Brookwater Golf Club - An 18 hole Greg Norman championship golf course and Australia's No. 2 public access course. Queensland Raceway  - Queensland's premier race circuit. This is the only location near Brisbane where members of the public can drive on the same racetrack as professional drivers. Champions Way, Willowbank. Bunya Mountains National Park  - Three hours west of Brisbane. One of the oldest national parks in Queensland. Home of the ancient bunya pine and many other species of plants, birds and other animals. Stay at least three nights to have time to hike in the park. This page was last edited on 14 March 2019, at 03:38.